Pre-printed Whiteboard Planners & Maps etc. 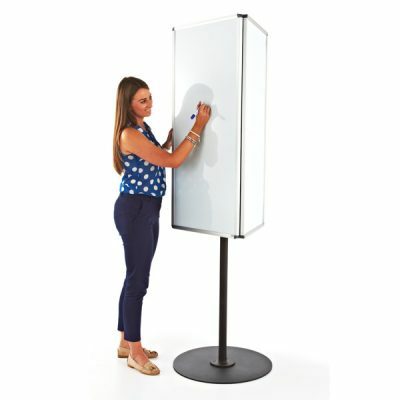 Outdoor fully water-proof & moisture resistant magnetic surface dry erase whiteboard. Available in a range of standard or custom made to measure sizes. Mitred sealed aluminium frame. 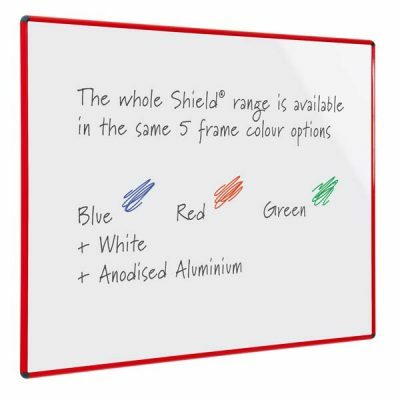 Looking for lockable external whiteboards? – Click here. 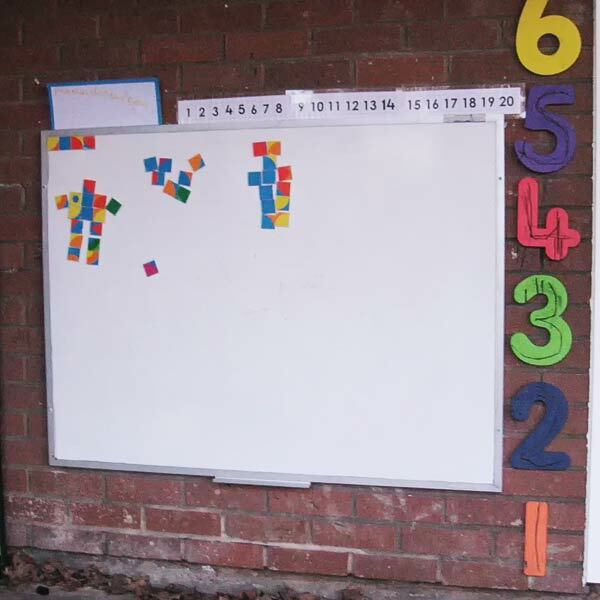 Magnetic outdoor whiteboards guaranteed for outside use. Features a quality, high pressure laminate (HPL) based board. The board is securely weather sealed where the frame meets the dry wipe surface. Thus preventing water ingress and more importantly moisture from entering inside board. The board uses a mitred frame which ensures there are no weak points in the corners. Long lasting sealants are further applied to prevent water ingress. 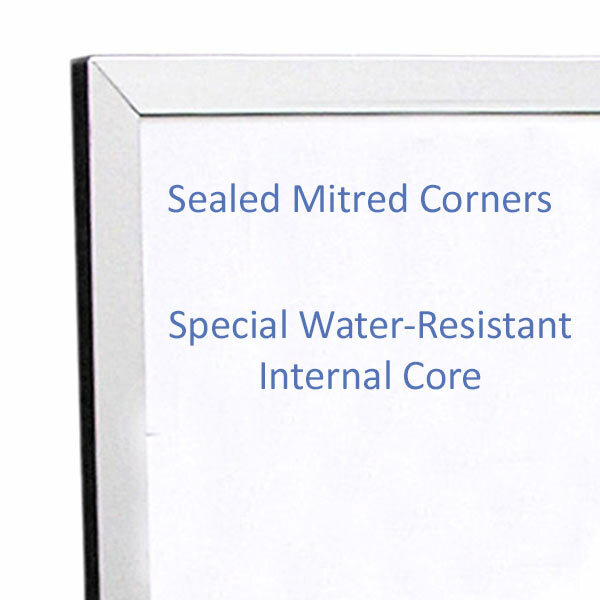 Through-the-frame holes, with protective nylon sleeves, allow wall mounting without compromising the water resistance. The carefully selected internal core is also moisture resistant. Designed from the outset to be used outdoors. Built to cope with varying weather conditions. From heavy rain to snow & ice and of course our summers. An established and fully tested product which we have been providing for over seven years. Built with quality components to give you many years of trouble-free service life. Features specially sealed mitred corners in a hard wearing aluminium frame. The boards are available in a range of popular standard sizes. Or can be cut to size to fit your exact requirements. Coloured frames are also available as an optional extra, please ask for a quote. We can also custom print these boards with your graphics and text, please ask for details. Made-to-measure sizes at no extra cost! 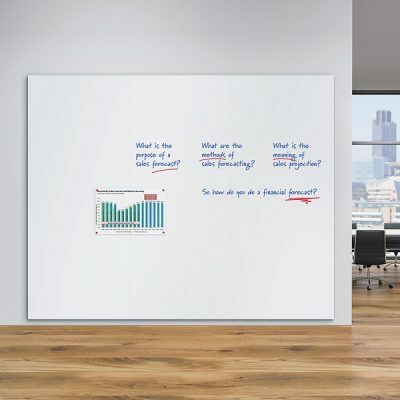 Yes, we will manufacture a cut to size external whiteboard without an additional charge. You simply pay for the nearest standard size we can cut your custom size from. Please contact us if you require this option. 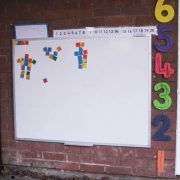 Guaranteed for 5 years these external use whiteboards are a great teaching aid for junior schools & nursery playgrounds. Also suitable for construction sites, outdoor notices & many other uses. 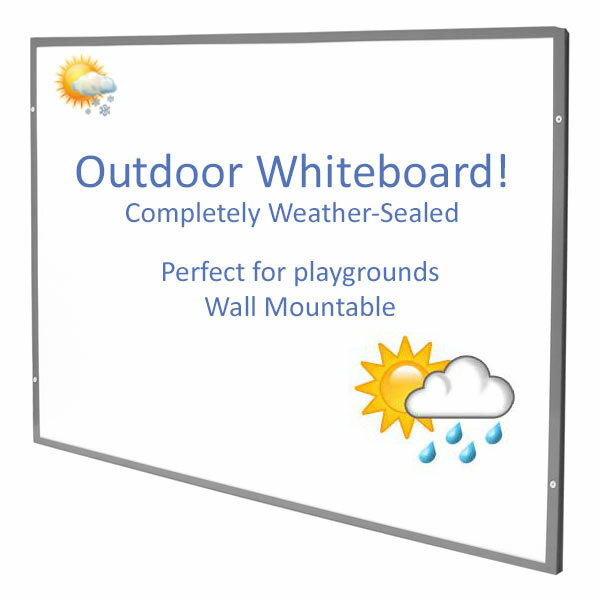 Learn more about these boards, read our article – Can I Use Any Whiteboard Outside? Can I Use Any Whiteboard Outside? Cork Notice Boards – Why do they make such good pin boards? 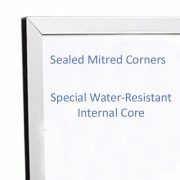 External Notice Boards – Certified Water Proof?